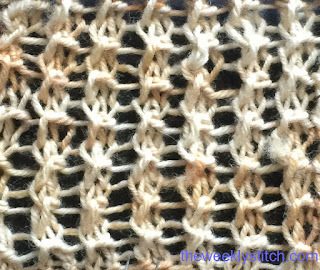 My sample has 2 reverse stockinette stitches between the panels; you can space the panels as wide or narrow as you like, and you can also use garter stitch, stockinette, seed stitch or even a cable between the panels. 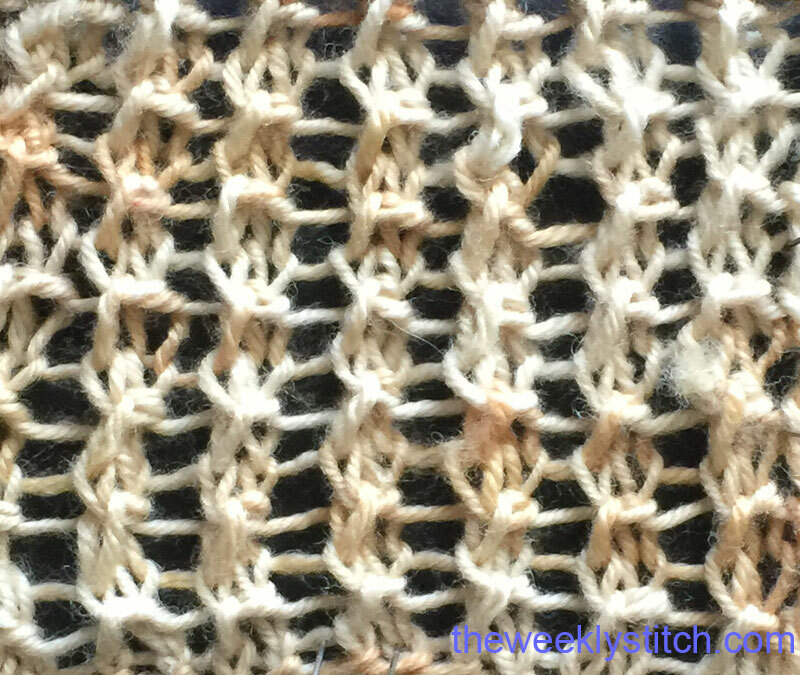 Depending on how you are using the panel, you may want to add one or more stitches to the beginning/end of the row to neaten things up. 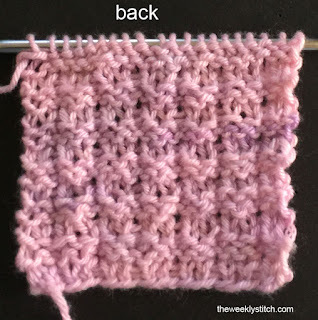 To make springs: wyib, insert right needle into next stitch as if to knit, wrap yarn around both needles ten times, then pull working yarn through all wraps and the stitch you are working into. 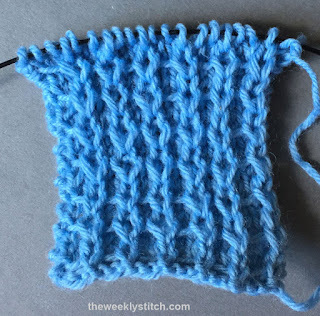 Slip from left needle; take working yarn to the right and pull out wraps. 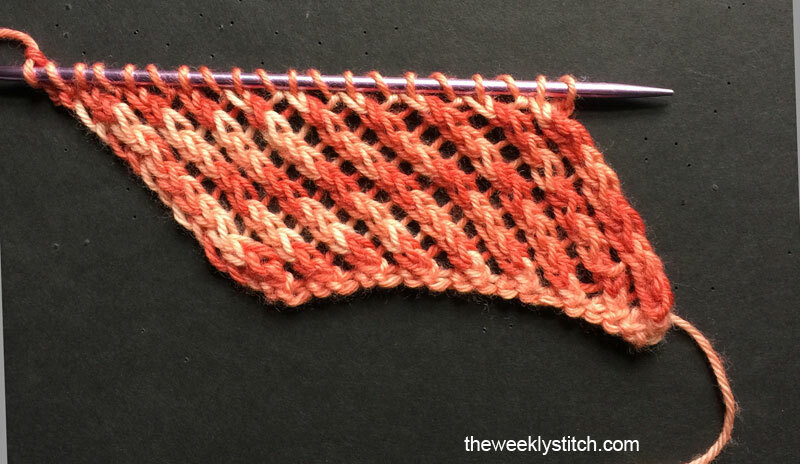 Then, gently pull on working yarn to coil the wraps up next to the needle. 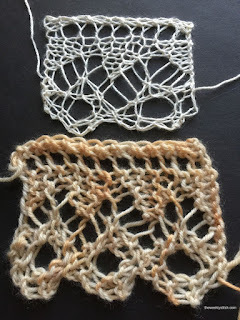 Don't wrap too tightly - and remember, practice makes 'springs'! 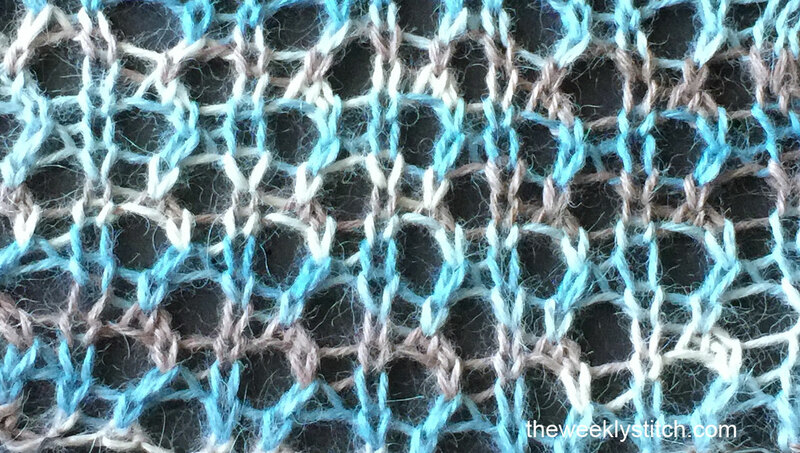 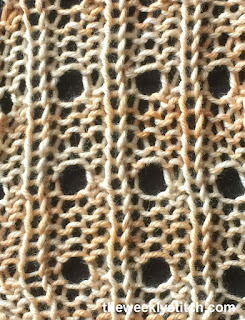 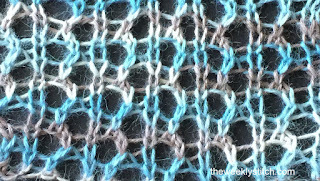 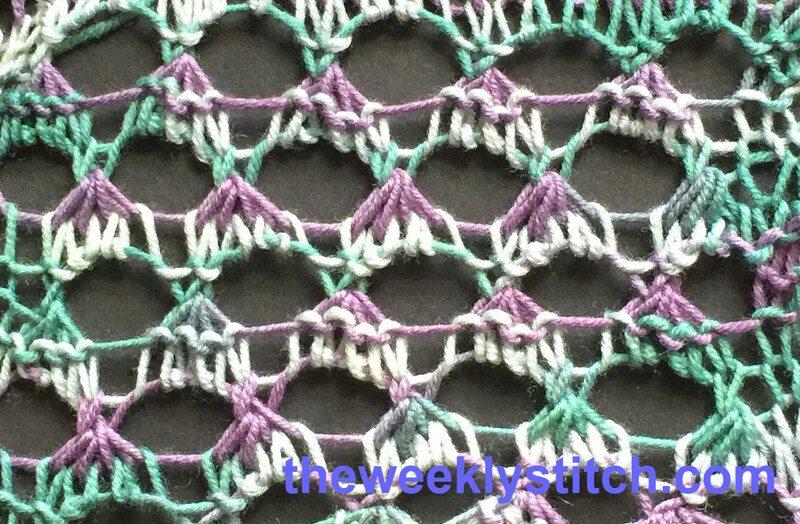 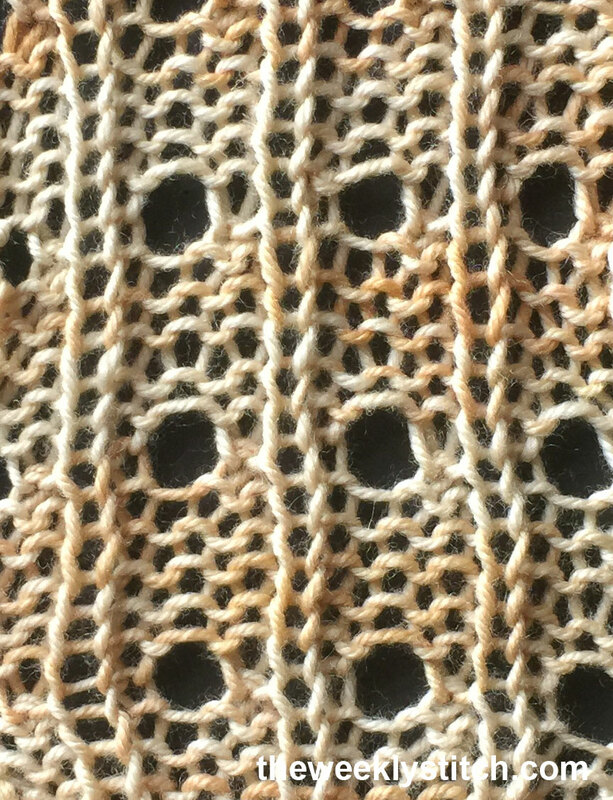 This stitch creates a bias fabric. 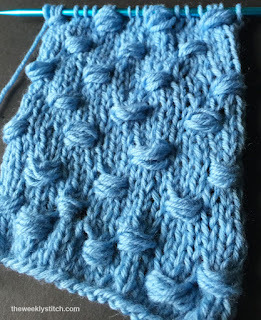 Row 1 (RS): k2, * yo, ssk, k4; repeat from * to last 2 sts, yo, ssk. 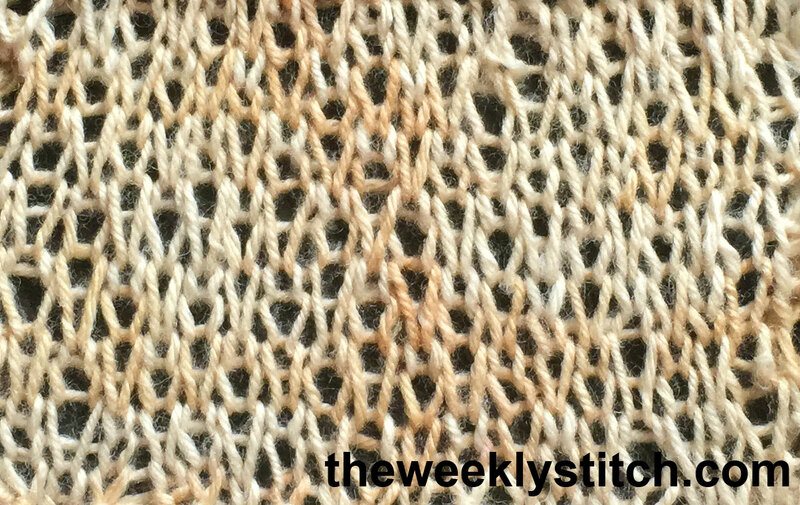 Row 3: k2, * yo, k1, ssk, k3; repeat from * to last 2 sts, yo, ssk. 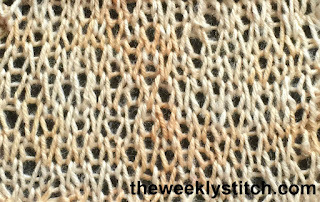 Row 5: k2, * yo, k2, ssk, k2; repeat from * to last 2 sts, yo, ssk. 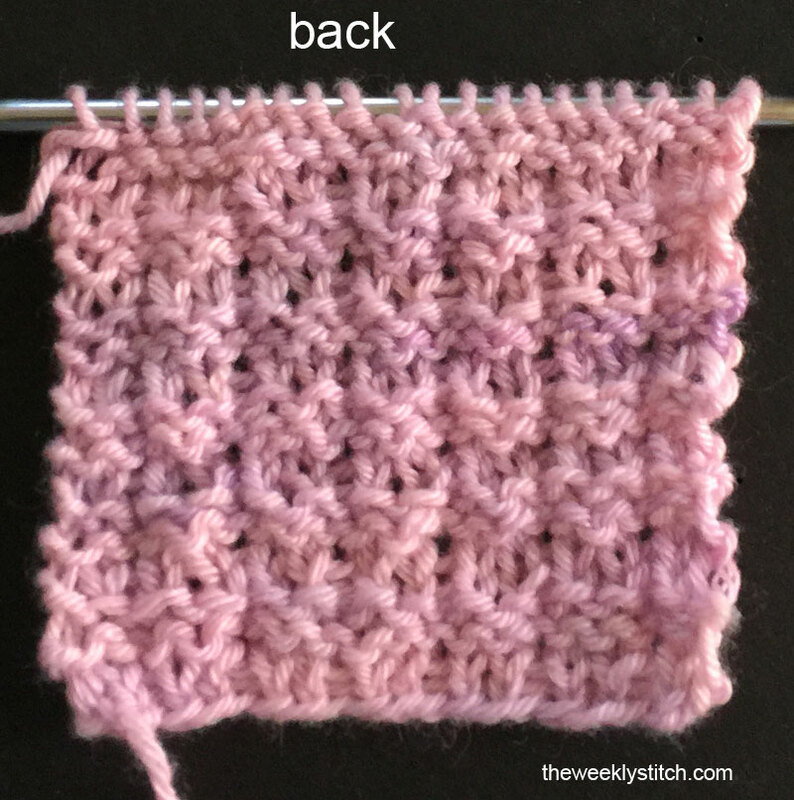 Row 7: k2, * yo, k3, ssk, k1; repeat from * to last 2 sts, yo, ssk. Row 9: k2, * yo, k4, ssk; repeat from * to last 2 sts, yo, ssk. 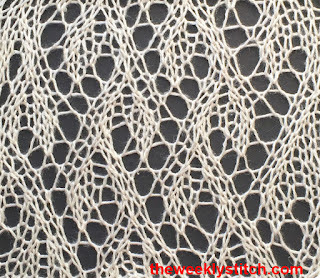 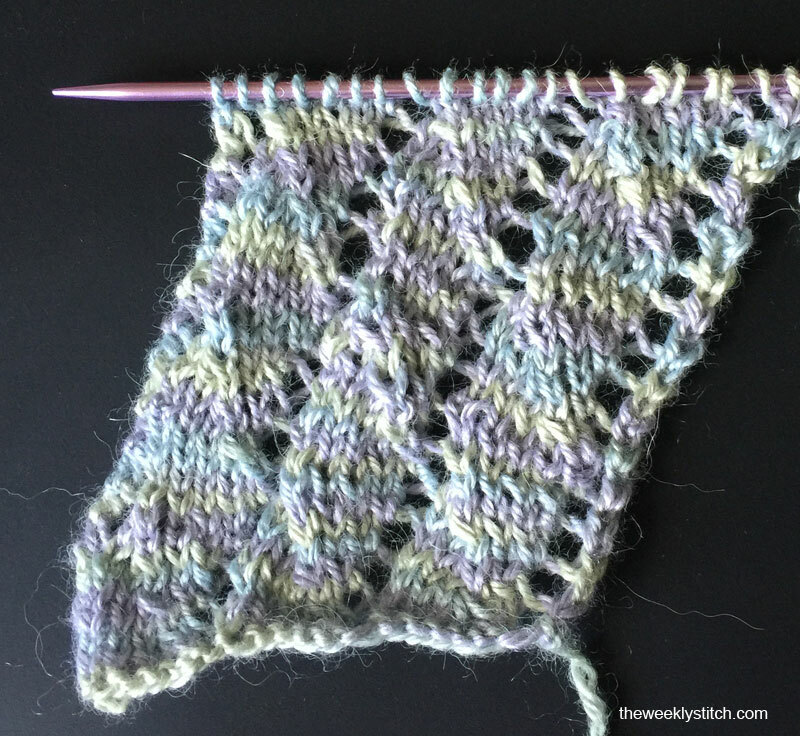 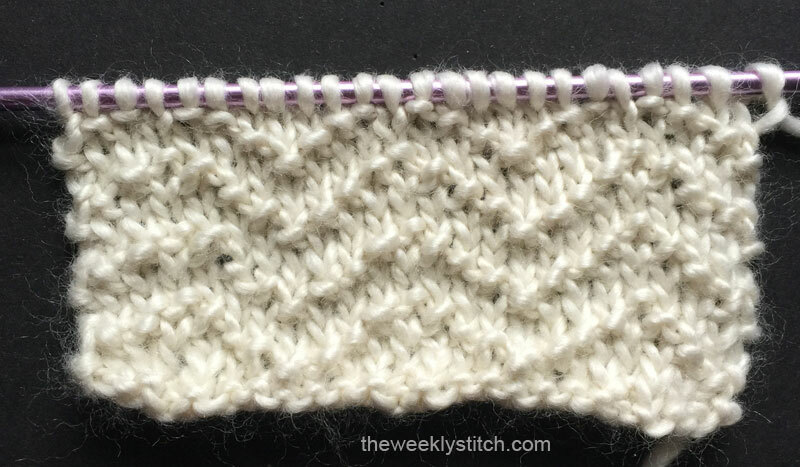 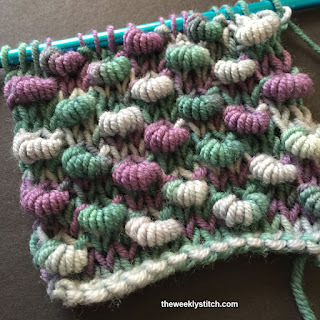 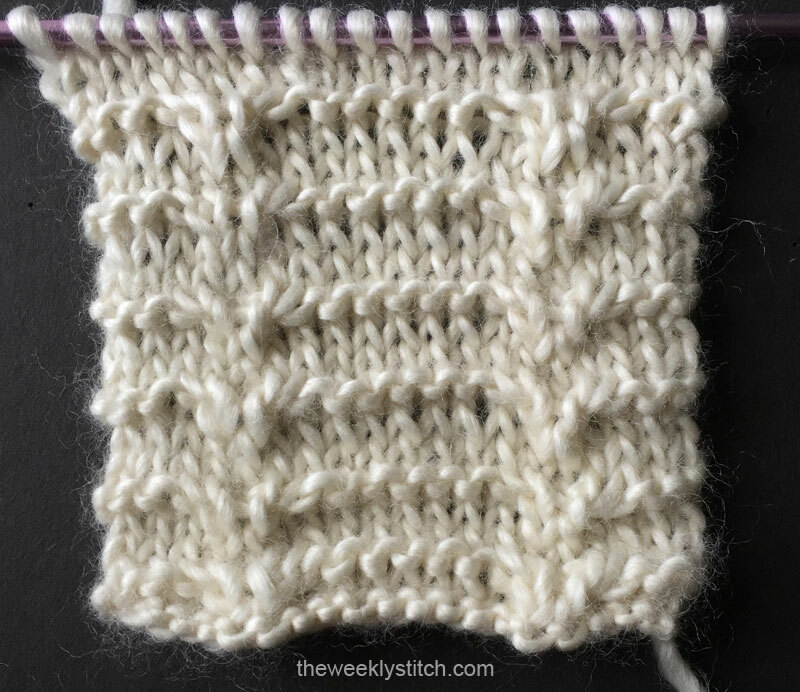 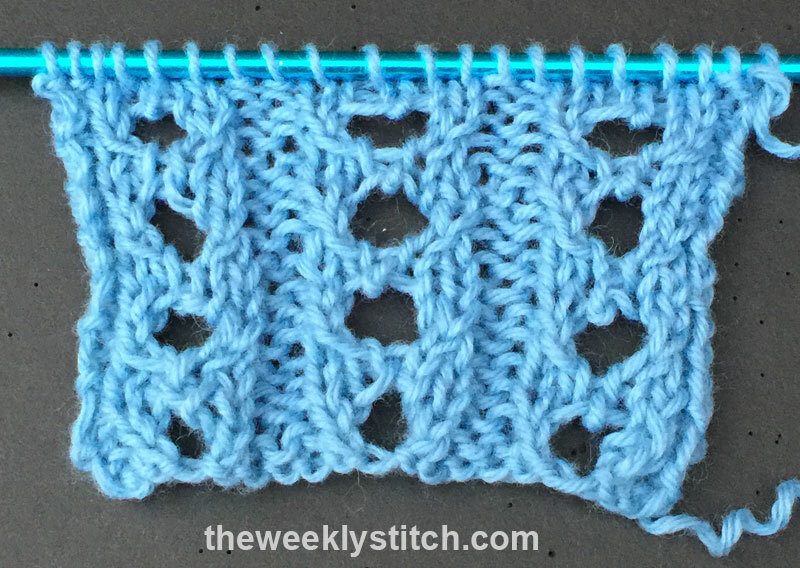 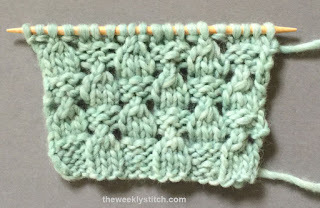 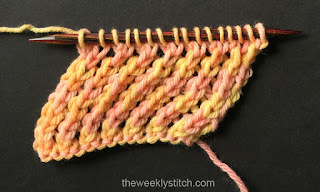 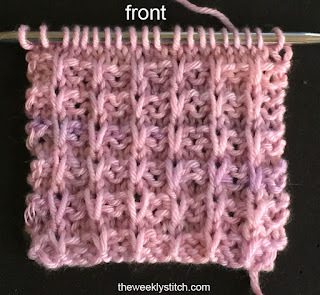 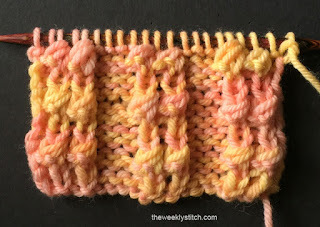 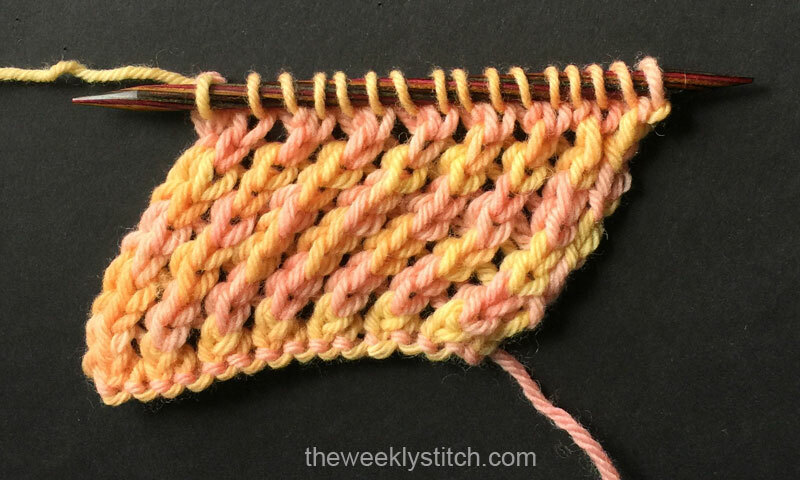 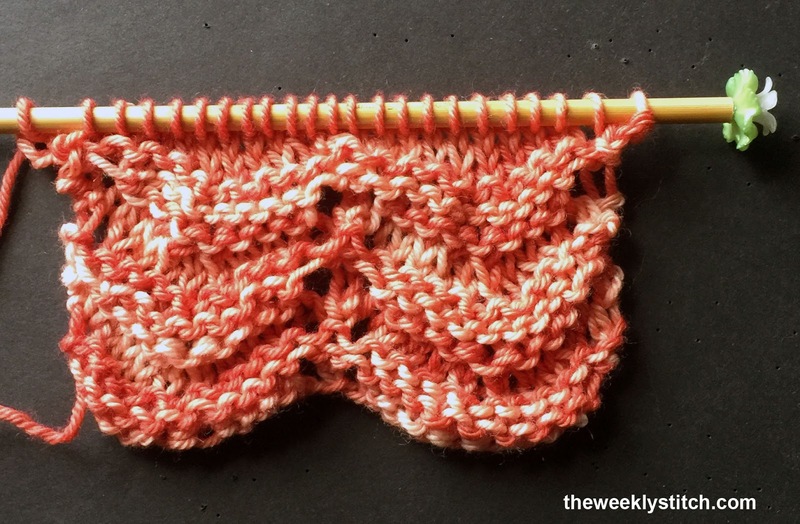 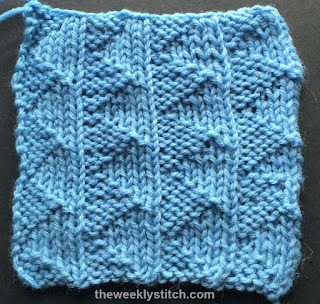 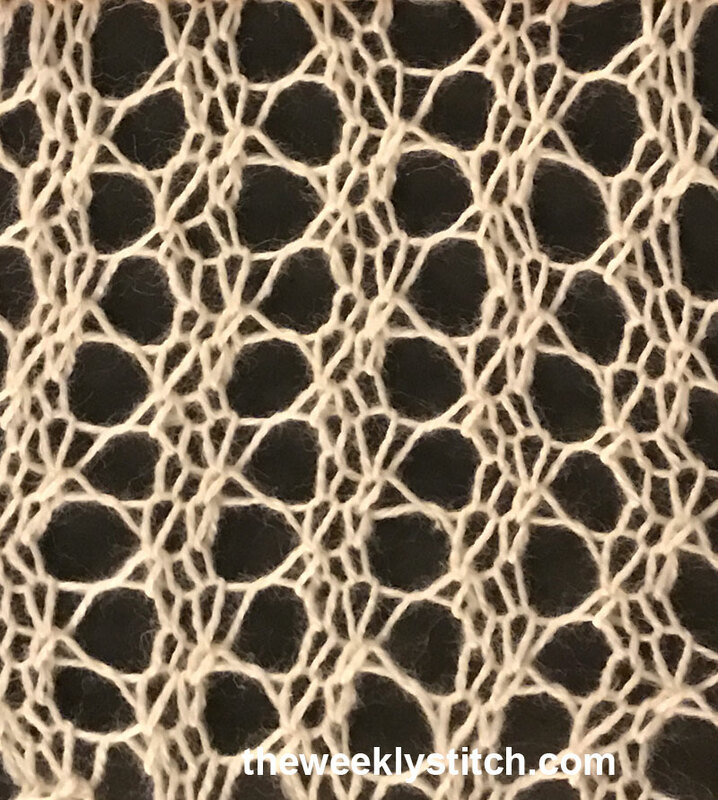 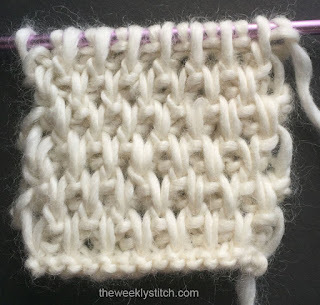 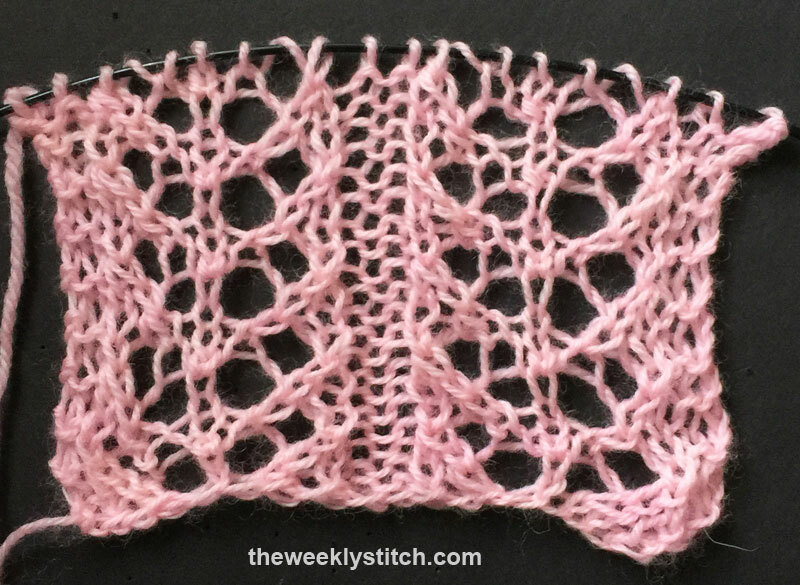 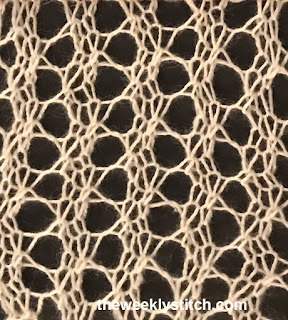 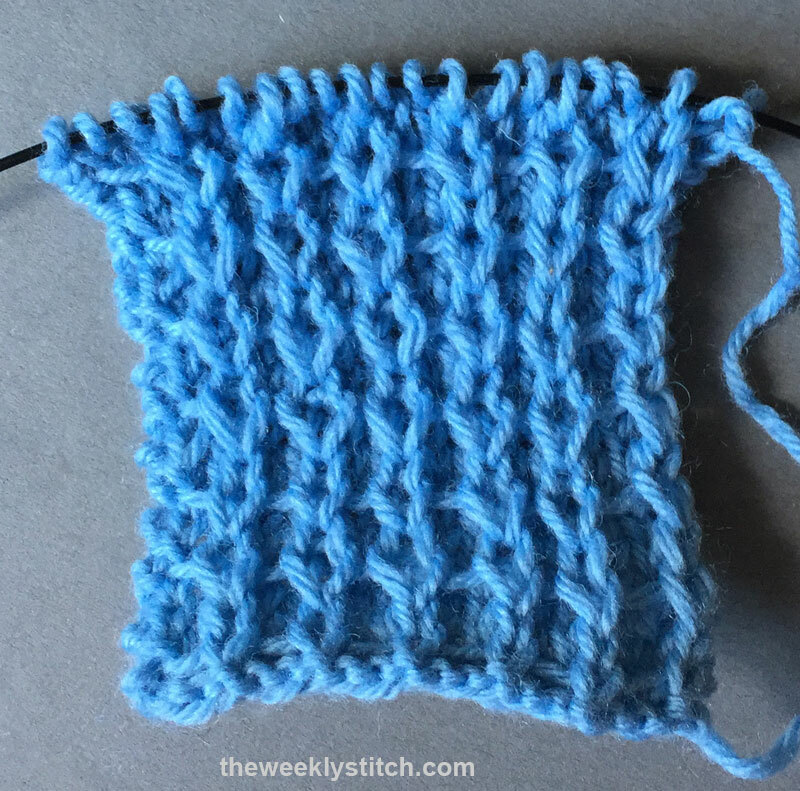 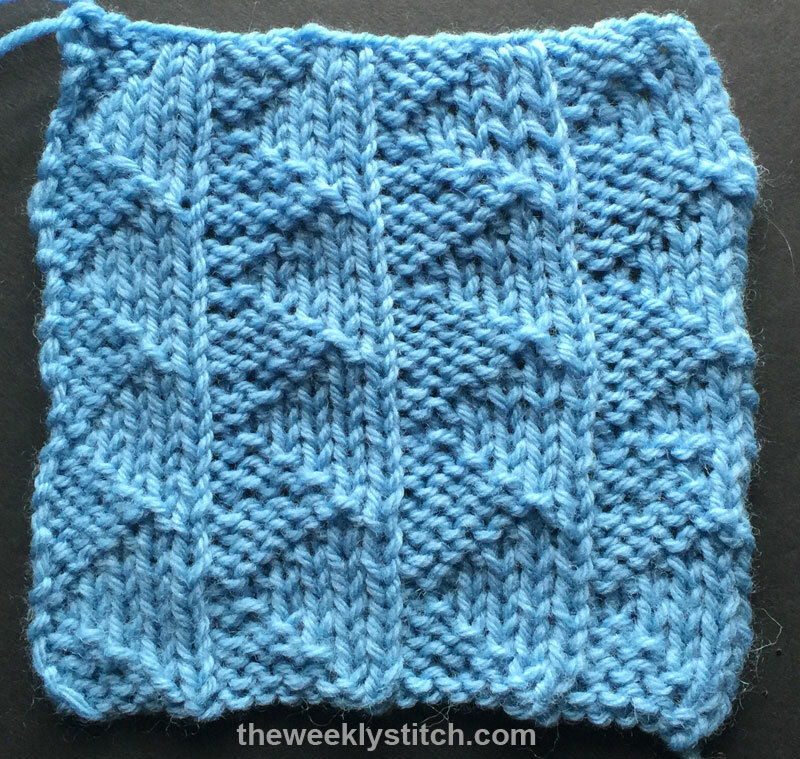 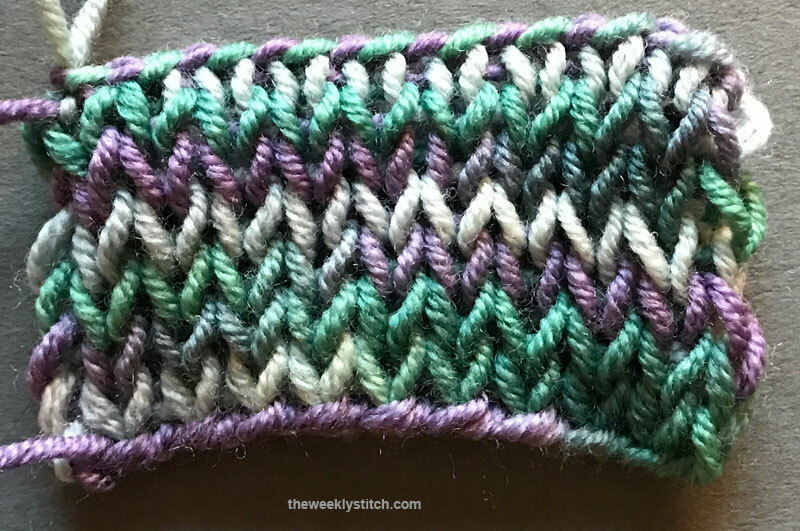 The edges do curl due to the panels of stocking stitch along the sides, so depending on how you plan to use the stitch, you may want to add a seed or garter stitch border. 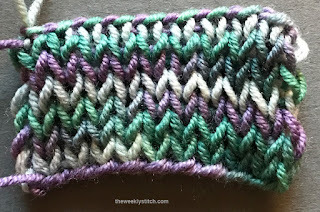 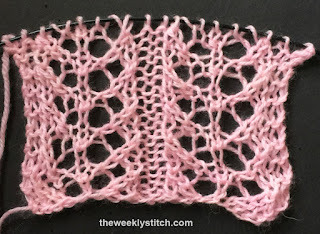 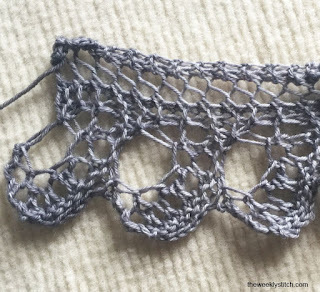 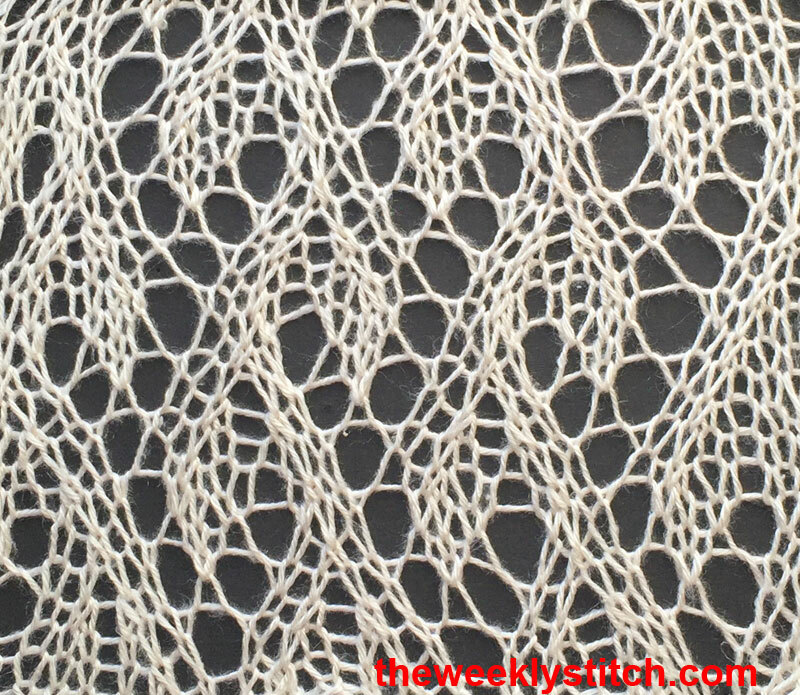 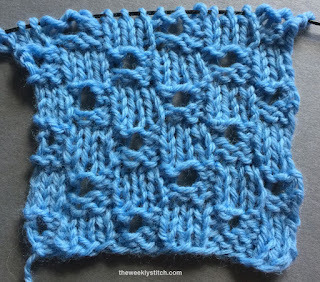 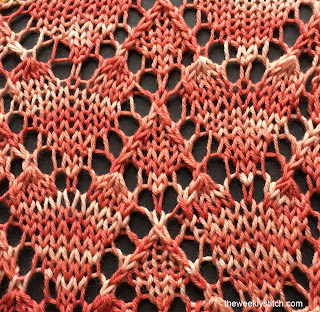 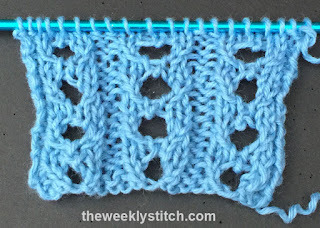 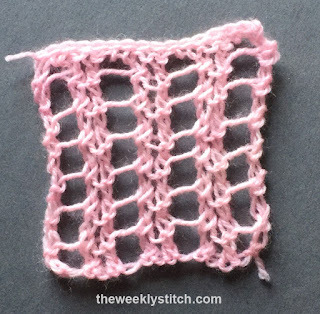 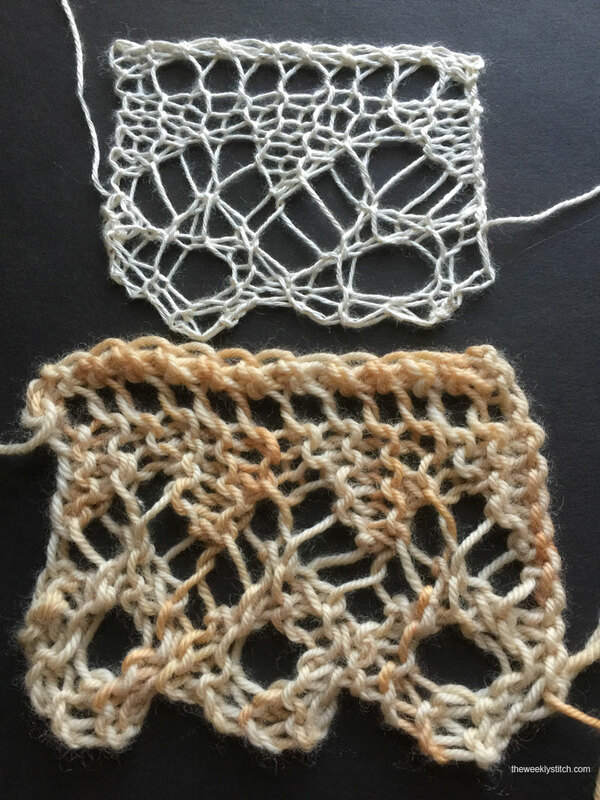 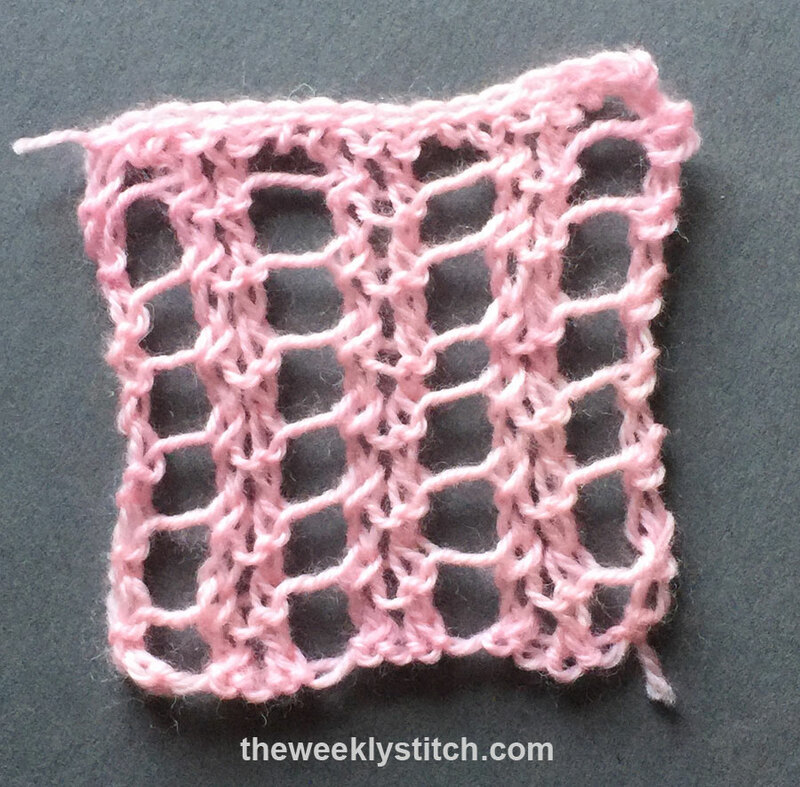 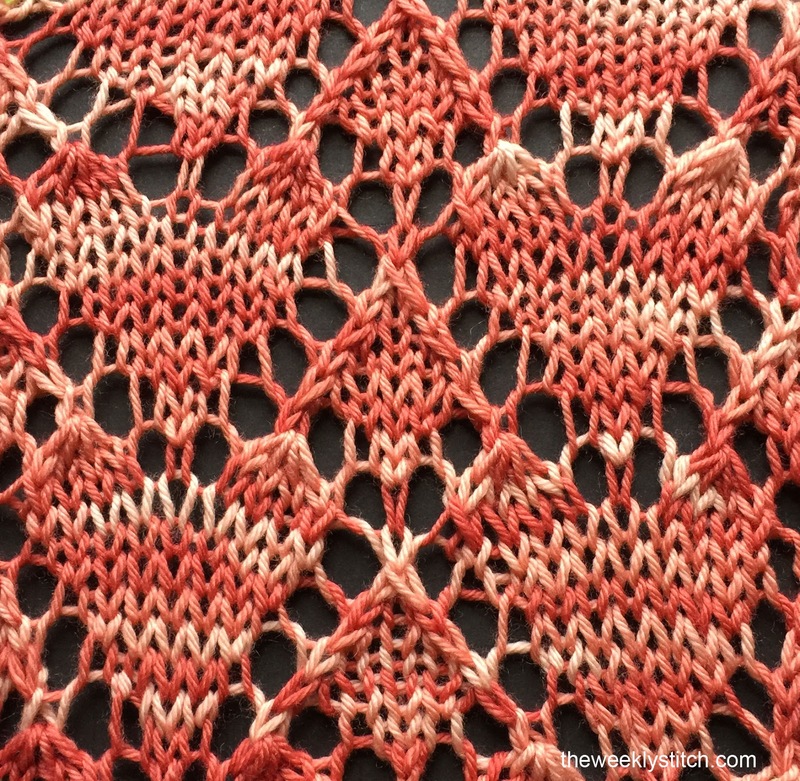 This stitch looks great on both sides, perfect for a scarf or other project where the back will be seen. 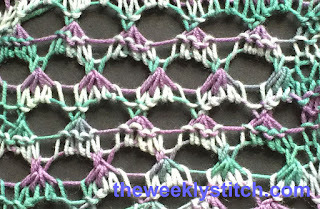 It also lays flat, but the edges are sloppy so you may want to add a border depending on how you use the stitch.